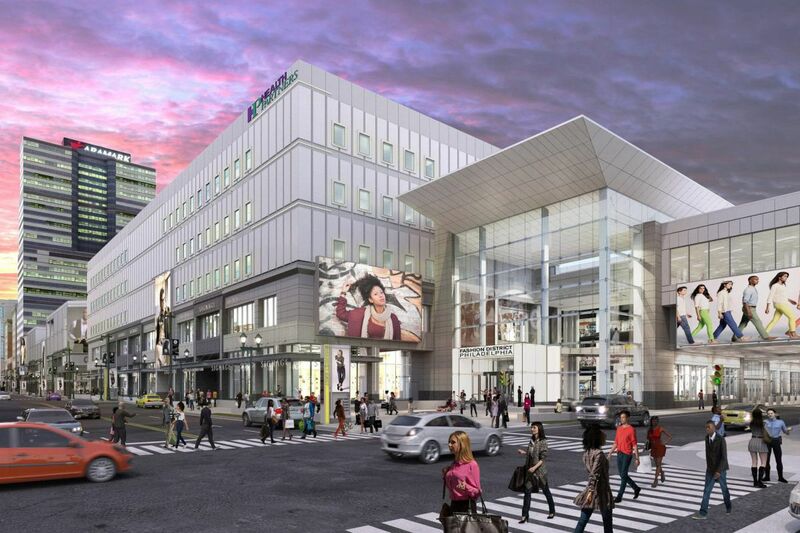 Artist's rendering of the section of the former Gallery at Market East shopping mall that houses 907 Market St. offices, after redevelopment into what's being called Fashion District Philadelphia. The former Gallery, now dubbed the Fashion District project, will include a collection of small, local businesses when it opens in September on east Market Street. The businesses, South Fellini, American Hats LLC, Dolly’s Boutique, and Duafe x the Sable Collective, will be the first tenants for Uniquely Philly, a collaboration with the Wharton-founded Enterprise Center to offer services, such as business plan development, store design, and marketing. The Uniquely Philly space will take up 4,647 square feet on the concourse level of the giant project, which is being redeveloped by local mall operator Pennsylvania Real Estate Investment Trust (PREIT) and Santa Monica, Calif.-based Macerich. The redevelopment of the Gallery into the Fashion District has been in the works for years, so some readers have asked what is happening with the construction and what tenants will be in the space. One reader asked specifically about the construction through Curious Philly, the forum where you can ask our journalists questions. The estimated $400 million to $420 million project began in 2014 when PREIT joined with Macerich to redevelop the Gallery and has been under construction since 2016. It spans Market Street between 8th and 11th streets and will have 838,000 square feet of retail. Coradino told investors in February that this is the company’s “marquee project." The Fashion District Philadelphia is scheduled to have a grand opening on Sept. 19 with about 65 percent of tenants in operation by then. The project is expected to reach 85 percent occupancy in the first half of 2020. Artist's rendering of entrance to H&M store at the Fashion District Philadelphia mall being developed in Center City. Artist's rendering of "Market Eats" food court at the Fashion District Philadelphia mall being developed in Center City. Exton Square Mall, Round One Corp.'s 12th U.S. store, will have more than 300 arcade-game consoles.